The Husky Hunter is a very special computer as it was designed to work in all environments (Aluminum alloy case). It is a rugged field computer. It has military characteristics : it is waterproof (against accidental immersion) and shock-proof, and its autonomy can exceeds 45 hours (the endurance time of 45 hours is only achieved with Alkaline batteries, with NiCd they only last about 16 hour). The british army was using some Husky-Hunters in 1983. It was also quite used by doctors and scientists in Africa or poor countries, where you need resistant and autonomous computers. The Husky-Hunter has several programs in ROM: a small NULL modem transfer program and a terminal emulator. It has a also communication-oriented Basic to handle the RS232 and the bar-code reader. In fact most applications developped for the Husky-Hunter consisted of data entries and then transfer of this data to bigger computers. Hence the RS232 serial port on a standard 25 pin "D" connector. Communications could be done up to a 4800 asynchronous baud rate. There were a wide range of protocols supported, including the IBM 2780 fully synchronous implementation (handshaking: RTS, CTS, DTR, DSR, RI, CD all selectable from BASIC). The built-in Basic is also very powerful with graphic statements (CIRCLE, LINE, etc.). It is possible to redefine the characters and even the function keys. Another very interesting fact is that there is a real time clock, so that the time of the day is software accessible. Programs and data can be stored indefinitely in the battery supported memory of the Husky-Hunter. There's even a file manager running under the DEMOS operating system (CP/M compatible). The Husky-Hunter can also be used to receive data from measurement systems and/or bar-code reader. The hunter completed his IBM friendly ability with built in EBCDIC translation. The keyboard was completely 'soft' and customizable with poke's from BASIC. The Husky's manual embraces proudly 'full compatibility with CP/M programs for z80 and 8080 procesors. The Hunter was not the first model. 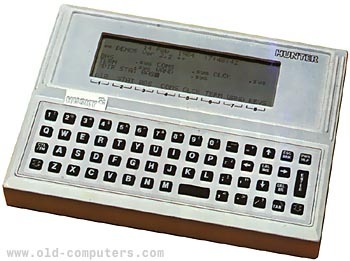 The first Husky, released in 1981, was a bit less powerful, had a LCD screen of only 32 x 4 characters and a flat membrane keyboard like the Sinclair ZX-81. see more Husky Computers Limited HUSKY HUNTER Ebay auctions !